No - this is not an obscure Ghostbusters reference. According to the Financial Times, geo-engineering experts at the UK-based Institution of Mechanical Engineering (IME) have deemed "slime-covered buildings", along with artificial trees and reflective buildings, viable options for removing carbon from the atmosphere. Although "slime" is a slightly hyperbolic reference to strips of carbon-consuming algae, a recent report by IME says the substance can be installed via bio-reactors on building walls to absorb carbon from the air. 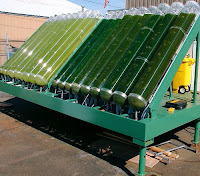 Before it decomposes (and really gets slimy) the algae is collected and either decarbonized or reprocessed as fuel. While "slime" carbon capture is still in the planning stages, it is an extremely attractive geo-engineering option because its waste could be used as a biofuel and it would require no additional land to deploy. Geo-engineering is not an encompassing solution to global warming. It is however, another potential component in our approach to climate change that could prove the world with extra time to decarbonise the global economy, a task which has yet to begin in earnest. Much of the resistance to geo-engineering innovations - such as faux-trees that capture carbon more effectively than the real thing - is based on the fear that these technologies will replace clean energy technology as the preferred solution to reducing carbon intensity. The report emphasizes, however, that geo-engineering is not the so-called silver bullet solution, it's a stop-gap measure that will help manage the world's carbon overstock while clean energy is being developed and deployed. The report explains that within the larger context of the "MAG Approach" (mitigation, adaptaion, and geo-engineering), an investment of $16 million (10 million pounds) would not only spark more geo-engineering research, it could pay dividends by creating 500,000 jobs by 2020. In its coverage, the Financial Times Energy Source blog refers to the Breakthrough Institute's interview with Columbia University scientist Klaus Lackner, who deserves credit for designing the artificial tree concept. In his discussion with Breakthrough, Lackner estimated that the cost for capturing one tonne of CO2 was approximately $30. According to the IME, at a cost of $20,000 per tree, a "forest" of 100,000 could capture all of the UK's "non-stationary and dispersed emissions." Breakthrough advocates for deploying a suite of technologies that will help transition the U.S. and the world to a clean energy economy and mitigate climate change. Geo-engineering technology has the potential to play an important role in that portfolio as an insurance policy against the catastrophic effects of climate change. The report focuses on implementing geo-engineering in the UK, where concerns about meeting carbon emissions targets and energy supply stability have been making headlines. Yet, the implications of geo-engineering have a global relevance, particularly to the United States. While geo-engineering may not be a priority in the U.S. climate and energy debate, its potential as an interim solution for managing carbon emissions is another example of the need for a coordinated, cohesive energy policy that includes large-scale investment in clean energy and related R&D. Yet, in the U.S. it is hard to imagine finding the funding for geo-engineering research when the proposed climate and energy bill, ACES, as it stands, would invest far too little in the clean energy technology that is vital to kickstarting the economy and permanently solving the climate challenge.